Striker Katie Wilkinson says Aston Villa Ladies are using their male counterparts' FA Cup run as inspiration as they also look to reach the semi-final of the women's competition. Villa Ladies take on Notts County in the quarter-finals on Sunday, with Tim Sherwood's men's side facing Liverpool in the last four a week later. "We have both had great cup runs and we are in it together," said Wilkinson. "The men have done well and it would be great to be there for each other." For the first time, the Women's FA Cup final will be held at Wembley. And with Sherwood's Premier League side heading to the national stadium for their semi-final already, Villa Ladies defender Jade Richards said the chance to emulate them has added extra excitement to this year's competition. "For the final to be at Wembley is motivation enough," said Richards. Lifelong Villa fan Wilkinson added: "If we could get to Wembley as well that would be class." Villa Ladies are one of just three sides from outside the top tier of English football to reach the quarter-finals. It is their equal best run in the competition, having gone out to Chelsea in extra-time in the last eight of the 2009-10 competition. "We can't say that we will be at this stage again next year so we need to leave everything on the pitch and run our socks off," said Richards. "It is an appropriate cliche to say it is now or never for us." While Notts County are among the favourites to win the Women's Super League One title, WSL 2 side Villa have already upstaged top-flight competition this season, having beaten newly-promoted Sunderland in the third round. 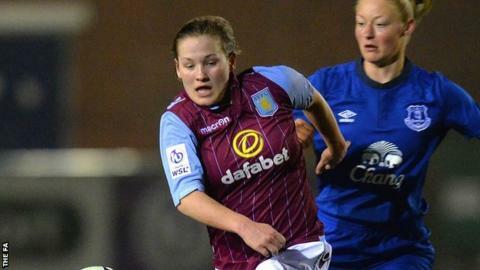 "Villa Ladies sides have not really had cup runs like this," said Wilkinson. "This is our journey and we want it to last a little longer."